This workflow is for ArcGIS Pro software users. 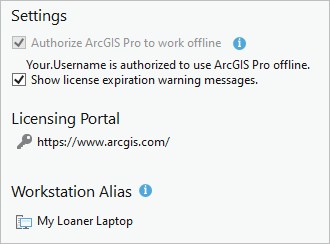 To use ArcGIS Pro with a Named User license, you must have a license assigned to you in your ArcGIS Online organization. The license assignment is made by your ArcGIS Online administrator. After you install the software and have been assigned a license, you can start using ArcGIS Pro. The ArcGIS Sign In window appears. Your user name and password for ArcGIS Pro are the same as those for ArcGIS Online. In the lower left corner of the window, the Sign me in automatically check box is checked. As long as you leave this box checked, and do not explicitly sign out of ArcGIS Pro, you will not have to provide your user name and password the next time you start the application. Your name and active portal connection are displayed in the upper right corner of the ArcGIS Pro application window. You can be signed in to ArcGIS Pro on up to three computers at the same time. If you get an Invalid username or password error, you may have mistyped your credentials. For other sign-in errors, see Sign in troubleshooting. 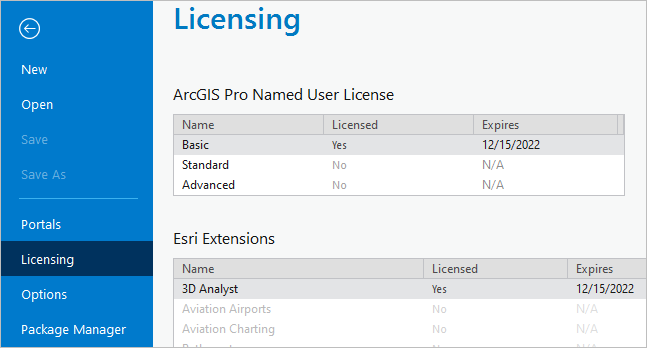 In ArcGIS Pro, you can view your license information, including your license level and the extensions you are authorized to use. On the ArcGIS Pro start page, click Settings in the lower left corner of the application window. Alternatively, if you have a project open, click the Project tab on the ribbon. In the menu on the left side of the application, click Licensing. Extensions are displayed under Esri Extensions. You are licensed to use any extension with the value Yes in the Licensed column. To change your license level or available extensions, contact your ArcGIS Online administrator. Click the Back button in the upper left corner of the application or press Esc to return to the ArcGIS Pro start page or to your open project. If you need to work in a disconnected environment, you can authorize ArcGIS Pro to work offline. This allows you to use the application without being signed in to a licensing portal. When you authorize ArcGIS Pro to work offline, you can only use the application on one machine. This is the machine you use to take your license offline. If you work in an environment with periodic online access, you can sign in to an active portal to exchange content with ArcGIS Online when access is available. Even when ArcGIS Pro is authorized to work offline, you must sign in to an active portal to get content from ArcGIS Online or share content to ArcGIS Online. For more information, see Manage portal connections from ArcGIS Pro. Under Settings, check the Authorize ArcGIS Pro to work offline box. The check box becomes unavailable and a prompt appears. 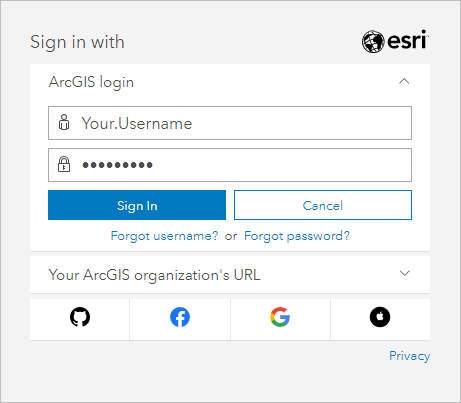 On the prompt, click Yes if you want to connect to an active ArcGIS Online portal to access or share content. Otherwise, click No. If you click No, you can connect to an active portal later when an Internet connection is available. Your ArcGIS Online administrator can disable offline use of ArcGIS Pro for the organization. If offline use is disabled, an error message appears when you check the Authorize ArcGIS Pro to work offline box. When you work in a connected environment again, you can return your license. Start ArcGIS Pro and sign in. You must sign in with the username and password of your licensing portal; that is, the credentials of the account you used when you authorized offline use. You must also sign in on the same machine that was authorized for offline use. In the options on the left side of the application, click Licensing. Under Settings, uncheck the Authorize ArcGIS Pro to work offline check box. A message box informs you that you must sign in to your licensing portal again. Sign in to reconnect to your licensing portal.